This picture has not been digitally altered. Maybe they got halfway through putting the stickers on the front, then realised the train was needed to run a service. In other news, while Metro got their June performance figures out almost two weeks ago, and Yarra Trams and V/Line have also published theirs, the Department of Transport still hasn’t put out their version. I’m told it’s not expected until late this week — perhaps their Apple II running VisiCalc is still churning through the numbers. 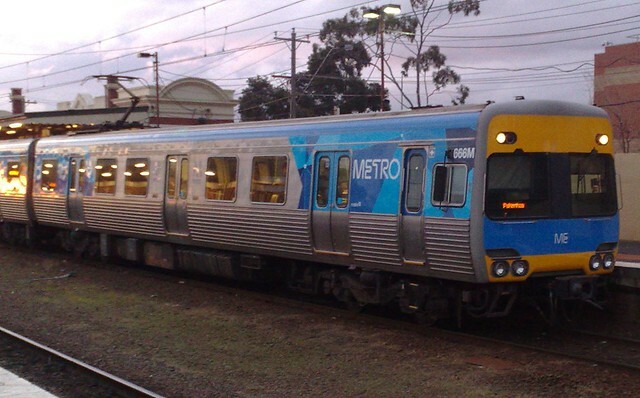 Metro and V/Line missed their targets; eligible passengers are encouraged to apply for compensation. So the 5-minute-late train was a 12-minute-late train by the time we inched our way in from Oakleigh to South Yarra – Had about 20 seconds to run up the ramp to the 6.28 Sandringham on Platform 2 which fortunately was a little late itself!!!!! So I’m not surprised if they’re having trouble with their performance figures!! I actually like the new metro livery on the comeng trains, it’s refreshing when compared to the usual window stripe that the other operators used. I wonder if they’ll bother putting new livery on the hitachi trains. What the devil were they thinking when they let that one out of the yard? Southern Cross Station Master’s Phone. A year ago, I was given the phone number to the Southern Cross station master by the man at the barriers… very useful, when the displays make no sense, you can call & get a better answer as to the delays which were occuring during the evening peak. Should I publish the number or delete it? 666M! Not sure I’ve noticed that before (or maybe it never travels on my line). I’ll be catching the next one thanks, lest I end up with characters from “Supernatural” travelling with me. I would publish the number as widely as possible, and encourage all my friends and acquaintances to call it, often. Metro should certainly be compelled to start crediting reimbursements to every Myki account automatically, perhaps as a set percentage of the total spent in the given month or something. Such that everyone’s fares are retrospectively discounted by a flat X% in a bad month. As you said, the current arrangement barely represents any incentive for improvement at all. Funny I took a shot of that train a while ago (shortly after it had it’s minor Metro makeover but before the real plastic surgery began). Got to love the Devil’s train running about. @Julian, I’ll see your Devil’s train and raise you a tram of the beast! Haha, fantastic. Love the Connex Station too! Been on this a few times. Hell, I think it was even published in an edition of the Herald Sun. If it helps, I have seen a Comeng in Metro temporary livery, and somehow the Metro coverup was ripped off, and underneath it one could see it’s Connex heritage….